Metallica was formed in Los Angeles, California in 1981 by guitarist and vocalist James Hetfield and drummer Lars Ulrich, after both had placed classified advertisements in the publication The Recycler about forming a band. The early incarnation of the band went through a number of members, including Dave Mustaine and Ron McGovney. Metallica got its name when San Francisco-area metal promoter Ron Quintana asked Lars to help pick out a name for his new magazine promoting U.S. and British metal bands. Quintana came up with a list that included the name “Metallica,” while Lars suggested “Metal Mania” and “Hesse”; Lars decided to use “Metallica” for the band’s name. Metallica’s original line-up consisted of Ulrich, rhythm guitarist and vocalist James Hetfield, lead guitarist Dave Mustaine, and bassist Ron McGovney. Mustaine and McGovney were later replaced by Kirk Hammett and Cliff Burton respectively. In September 1986, Metallica’s tour bus skidded out of control and flipped, which resulted in Burton being crushed under the bus and killed. Jason Newsted replaced him less than two months later. Newsted left the band in 2001 and was replaced by Robert Trujillo in 2003. Metallica’s early releases included fast tempos, instrumentals, and aggressive musicianship that placed them as one of the “Big Four” of the thrash metal subgenre alongside Slayer, Megadeth and Anthrax. The band earned a growing fan base in the underground music community and critical acclaim, with the 1986 release Master of Puppets described as one of the most influential and “heavy” thrash metal albums. The band achieved substantial commercial success with its self-titled 1991 album, which debuted at number one on the Billboard 200. With this release the band expanded its musical direction resulting in an album that appealed to a more mainstream audience. In 2000, M etallica was among several artists who filed a lawsuit against Napster for sharing the band’s copyright-protected material for free without the band members’ consent. A settlement was rÂ eached, and Napster became a pay-to-use service. Despite reaching number one on the Billboard 200, the release of St. Anger alienated many fans with the exclusion of guitar solos and the “steel-sounding” snare drum. A film titled Some Kind of Monster documented the recording process of St. Anger. has released nine studio albums, two live albums, two EPs, twenty-two music videos, and forty-three singles. The band has won seven Grammy Awards, and has had five albums peak at number one on the Billboard 200, making Metallica the only band to top the chart five times. 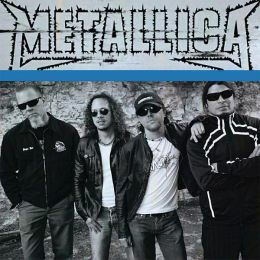 The band’s 1991 album, Metallica, has sold over 15 million copies in the United States, which makes it the 25th highest selling album in the country. The band has sold over an estimated 100 million records worldwide as of the release of their latest album Death Magnetic. We hope you enjoy our Metallica Fan site! We have songs, videos, lyrics, Mettalica info, Metallica T shirts, trivia and much more … Just pick a category from the right hand side of our site, use the search box or just browse around manually. And help us make a bigger better site by spreading the word and making us more popular.